The September 18, 2014 issue of the Troy Times-Tribune is now available. 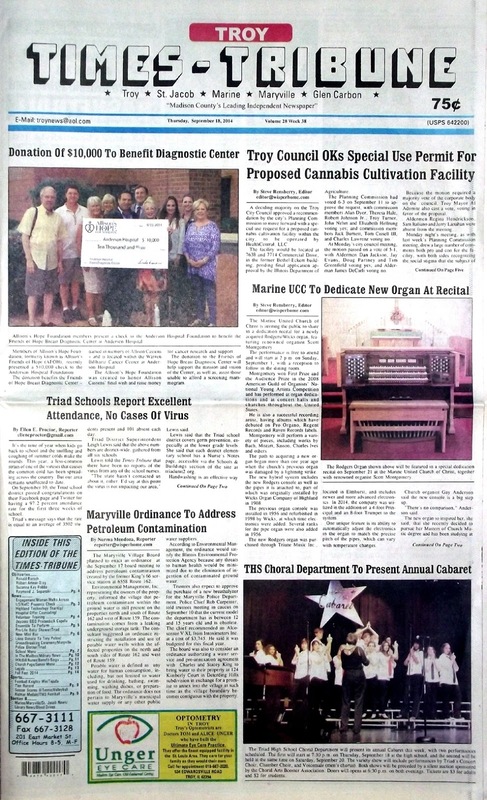 Some of the stories in this issue: Troy Council OKs Special Use Permit for Proposed Cannabis Cultivation Facility, Marine UCC To Dedicate New Organ at Recital, Triad Schools Report Excellent Attendance - No Cases of Virus, Maryville Ordinance to Address Petroleum Contamination, THS Choral Department to Present Annual Cabaret, Woman Walks Across U.S. in Support of Shriners, Troy Lions Club Donate $6,000 for K-9 Unit, Triad Knights Post Solid Win; plus a column about the end of summer and upcoming activities, police blotters, our usual "It Happened Here" page, and lots more! We have obituary listings for Ronald Barsch, Robert Amner Droy, Susanne Kay Robbs and Raymond J. Sepanski.